Many people have stated that the family of Jay Sebring was not close, they were estranged at the time of his death, they didn't attend his funeral. This has always been a close family. They mourned the loss of Jay deeply. As for the rumor that they didn't attend his funeral, I'm putting that one to rest right now. Here's his family at the funeral. The brunette in the blue dress and sunglasses is Cami Sebring, Jay's ex-wife. Next to her is Tony DiMaria, Jay's brother-in-law. You might be wondering where Jay's mom was. She was home in Michigan, completely bedridden with grief, unable to attend the funeral. The other sister (whose name I also won't mention) stayed home to take care of her mom. Jay's mom's 60th birthday was the day after her son's funeral. Following the California funeral, his body was taken to Michigan where another funeral was held for family and friends. The family still misses him and treasures their memories. Thanks Venus! Just another reminder of how all the families were affected by this tragic waste of life. This purposeful carnage orchestrated by Manson which wasted not only the victims' lives, but the killers lives too. They thought they were immune but finally figured out they weren't. Then when they couldn't get out of prison by hook or crook, they realized how stupid they had been. Too late. Margaret DiMaria says: The last time I saw him, the nightmare in my head is looking at him in the casket, swollen, really not recognizable for who he was. My mother had requested if at all possible that the casket be open because of all the horrendous rumors about being bludgeoned and people were cut up, and horrible, horrible things that the press sent out. She wanted that to be set aside. Of course, we found out she could not do anything about many lies and rumors and everything else that followed. But to think that my parents were going to see my brother like this, I just wanted to reach out and change it and fix him. You can't do it. His hands were stiff and in a position to where I could see him fighting for his life the last few minutes, trying to fight for Sharon and her unborn baby and all the others. Thanks so much, Venus. I never knew that any of Jay's family attended the California funeral. It was never mentioned in the press, as far as I know. Did you ever visit Jay's grave in the cemetery in Michigan? The group who arrived at Cielo at midnight Aug 8. 69 had trained about house break-ins with knives and guns with the intent of killing months before they had selected individual victims. Jay knew these were incredibly violent vicious intruders he was facing. The victims may have been random but the killers were trained. No home owner would stand a prayer against guerilla type intrusions. Carol, yes, I visited Jay's grave. There's a thread on here about it. Look under his name in the index. Margaret's statement is just so sad. Makes you realize that the families were well aware of the nonsense that was being said about their loved ones. Mr. P., Margaret DiMaria was talking about how the press buried her brother and the other victims. I remember when this happened. At first, the press was very sympathetic toward the victims, but it didn't take long at all for that wind to change course. This was a HUGE news story, and any crackpot who called up with anything was regarded as truthful. Therefore, we had story after story after story that came out, bashing the victims. The "towel" on Jay's face was some kind of "cult activity". This type of newscasting made people feel "safer". If the victims were involved in something dangerous and deserved to die, then the rest of us are safe. The public ate it up like starving hyenas. People who weren't alive then don't know this happened. It wasn't until December 1, 1969, when Susan Atkins told the Grand Jury what happened, and it came out in the papers, that we really understood what happened. 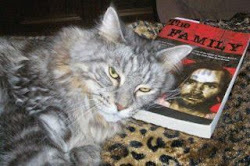 Susan told the world that the murders happened because their hippy cult leader, Charles Manson, told them to kill. "The 'towel' on Jay's face was some kind of 'cult activity'. This type of newscasting made people feel 'safer'. If the victims were involved in something dangerous and deserved to die, then the rest of us are safe. The public ate it up like starving hyenas." - Very true, Katie. I was in high school when the murders happened. I remember reading all this nonsense in the papers. I didn't realize at the time how much it must have hurt the victims' families. I think Jay got the worst of the press in the early days, if I remember correctly. My high school memories may be failing me - it was a LONG time ago. Sharon, too, what with the talk of the Cielo orgies, satanic worship, etc. Carol I remember reading all about this stuff in the paper too. Back then, I didn't really know who any of these people were except for Jay Sebring, and I had only heard of him because some of the boys where I lived were getting Sebring haircuts. I had never heard of Sharon Tate or anyone else at that point. So when they starting putting articles out about them being in demonic activity or some kind of orgies, I just assumed all that was true. And yes it did seem to focus more on Sharon & Jay. I guess that was more exciting than saying Leno & Rosemary were having orgies. LOL. But it wasn't until December of 1969 when we found out that some hippy kids killed these people for their cult leader that we realized all those stories about cults & orgies were just news items hoping to sell papers. I ran across what I think is part of the film "My Life After Manson" where Patricia Krenwinkel gives an interview. This link may not work for everyone, I had to turn off "ad block" to get it to play, it's on "Yahoo Screen", the clip is-->HERE. Sometimes Yahoo only leaves these type clips up for a few hours or days, so it can disappear at anytime. Thanks Sunset. I put that clip up on my blog but it might disappear, I don't know. She says a lot without really saying anything. We already knew that she had an unhappy childhood, her sister had a kid and was on drugs, she went to live with her drug-addled sister then she met Charlie. So that's nothing new. She alludes to the fact that the "love" she felt from Charlie is what compelled her to act as she did those 2 nights of murder, but doesn't really come right out and say it. BTW, she's definitely sporting a new pair of dentures. LOL. Anybody else have any thoughts if you've reviewed the clip??? Krenny says she just wanted to be loved. Says she grew up in a silent, loveless home. This is similar to Pitman's description of growing up in a family where there was little intereaction. These explanations only cover what these two were involved in in 67 and 68 in the early, hippie days of the Manson Family. These explanations do nothing to cast any light on what they were involved in from 69 onwards. Why did murder enter the picture? Krenny nor Pitman have ever explained that. I find it difficult to believe that Krusty's parents didn't love her. 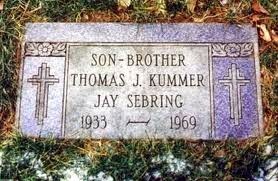 Jay's real last name was Kummer. There was a very very famous road course(not a nascar oval) style race track called Sebring International Raceway back then that he borrowed for his new professional Hollywood hair cutting name. Jay drove a Porsche and knew Steve Mcqueen who raced sports cars at Sebring Raceway. There were two other well known race tracks in California back then that are also gone now just as Sebring closed its doors too. The other two sports car biggies in the racing world were Altamont and Riverside. My favorite name that Jay used though was in a Batman episode he guest starred in. That name was Mr Oceanbring which was the character he portrayed. As we approach that most infamous of dates...anyone on Cielo Dr. get nervous?